Rethinking Faith and Church: Have You Eaten Your Tithe Yet? With so many Christians still practicing tithing, even though it is not a New Testament concept, I thought it would be interesting to look tithing from another angle; the dining room table. Where am I coming from? I’m coming from the same place that all tithing is taught; from the Old Testament. The way I figure it, if we use Old Testament to justify tithing in the institutional church of today, then we are also justified in using the Old Testament to justify the kind of “tithing” that I am exploring here. While the preceding is obviously an Old Testament passage, and as such many would argue is irrelevant to the church today, I would like to suggest that it is probably much more relevant to the kind of church life that Christ had in mind than we may realize. Certainly it is more relevant than my putting a tenth of my income into an offering plate so that some pastor can have an income and so that the mortgage and utilities of that building can be paid. Where the relevance of the Deuteronomy passage comes in is in the fact that it expresses one of the most beautiful parts of church life; fellowship around a table. It is almost like a love feast or potluck supper. Everyone brings to a common place whatever their appetite craves. They are admonished not to neglect anyone. The inclusion of wine and strong drink suggests that they are also cautioned against being legalistic. And there, in the presence of God and each other, they are to eat their tithe with thanksgiving. It almost sounds like a celebration or a party; it almost sounds like the “Wedding Feast of the Lamb” (Revelation 19:7-9). I remember our last pastorate. Even then we would often go to church only after having put a pot roast in the oven on a timer. Our practice was to always seek out a new face and invite that person (or family) home to share a meal with us. To this day I firmly believe that those people went home having made new friends. Church backgrounds and doctrines were, perhaps ironically, unimportant. Getting to know new friends and sharing life, and sharing Jesus, around a table (the Lord’s Table???) is what really mattered. Even then I already believed that “real church” happened after church. There is something beautiful about sharing a meal together. Unlike pew life, where division happens and walls are built up, table life lends itself to dissolving division and lowering walls. Forget the offering plate. Spend your tithe on whatever your appetite craves and invite your neighbours and friends to your table. 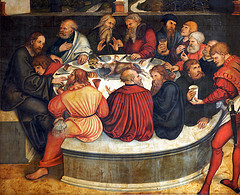 It is no coincidence that at a table is where the New Testament often depicts Jesus. Likewise, it is no coincidence that it is at a table that we still find Him today.